...and that's why it made perfect sense that the cats peed on my business suit. 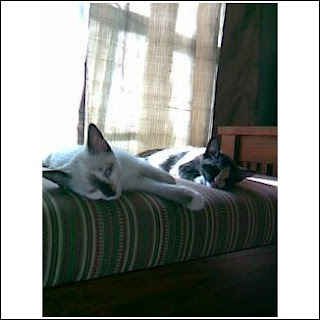 They are cute, these kittehs, but I now see that they are all a part of God's plan, my cross to bear, as it were. As I revealed in my post about how I know I am Chilean, I believe in the fair and equal balance of good and bad, which I hope/believe I can control through the Art of Self-Imposed Minor Suffering. If I have too good of a day or too much good comes, I'll spend the next day atoning, trying to bring my minor suffering back in line enough to mitigate any additional instances of major suffering. I'll drink my water without ice, and no flavoring of tea. I'll skip eye liner. I'll eat a Weight Watchers frozen meal instead of getting that Schlotzky's sandwich I want. I'll watch Duck Dodgers with the kids. As soon as good news came down the pipe, I know the bad will, too. I consider myself lucky because the universe likes me balanced in the middle, and I know it could be much worse on the other end. I could, for example, be the police officer who lost a handcuffed suspect on I-10, I could be the person who found that vicious -ism graffiti at the fire station, or I could have numb thumbs from too much texting. I don't know why the universe operates this way or why I have been selected for this section of the Bell Curve, although I've made plentiful contributions to the Fair to Middling Writers Fund by purchasing many books with theories. None of them know, either, but God love them for trying. It gives me hope that they do try. That same wishful wannabe optimism co-mingled with Chilean POV is why I'm willing to believe in the space elevator but not odorless, trackless kitty litter. I thought the universe spoke to me this week, actually. Through my purse. Which, when you think about it, is exactly the medium through which the universe ought to speak to a busy on the go woman these days. A burning bush would elicit a quick dial of 9-1-1 on the cell. An old man with long beard who is carrying a rock wold get a cash donation. But talking through a purse? That's a clever, modern God who has caught on to what we'll pay attention to. It was this past Wednesday afternoon when my purse reached out to me. I was in a rush, hustling from one thing to the next, in crazy heat. My purse---which is really a woman-mom-worker combo case---was heavy, banging against my back. I had the beginnings of a headache, which I counted as my due for having a seriously interesting day. I'd better get green tea, cold at least, instead of that coffee, I was thinking to myself as I muscled my way through heat so thick it felt like a new heavier gravity. Oh I wanted coffee, how I wanted it. Rich caffeine on ice with fat free soy and a dollop of French vanilla. Grande, of course. And that's when my purse spoke to me. "Progress report!" it demanded. Of course, I thought, of course when I have a Divine Amazing Interaction it will be incredibly practical and results oriented. Well I still need to write an article about that health rally on Monday, especially now that I've got those photos. Then there's the article about that sexist cartoon. And schedule the two chats I have in mind. Plus prep for that contract. Oh and call The Client, the One I've Been Needing to Call. Prepare for the kids' birthday party, follow-up on RSVPs. Buy the toys for the party. Promote the circus. Followup on that call. Write two more articles, fulfill volunteer obligations, reach out to those contacts, check on that thing....wow, uh, can you check back later, Demanding Universe? I stepped inside the Starbucks, expecting a cool blast of air, but found none. I was almost slightly relieved. This practically gave me permission to get the coffee, all things (and balance of suffering) considered. "Progress report!" my purse demanded again, and this time, the man in line ahead of me whipped around and shot me a look. I gave the startled deer in headlights look and innocent silent shrug. He narrowed his eyes at me, anyway. I now knew, however, that this wasn't all in my mind. "Just smile and wave, boys, smile and wave," my purse advised. Now the man's eyes widened. After another look at me, he turned away and edged forward slowly, away from me. I stuck my hand in my purse and began feeling around as nonchalantly as I could. The demands and advice grew more insistent, "Progress report! Smile and wave! Progress report! Smile and wave!" My hand landed on a small, hard toy. I pulled it out. A Madagascar 2 Happy Meal Penguin toy. I pushed the button on its back, "Progress report!" I pushed it again, "Just smile and wave, boys, smile and wave." "Ohhhhhhhhh," I exhaled in enlightened wonder. In front of me, the man's shoulders shook a little. I stuffed the penguin back in my purse, wait, maybe it would keep talking. I pulled it out and inspected it. Ah ha, an off switch. I stuffed the muted penguin back in my purse. But it's not nice to ignore the universe. It will get your attention, one way or another. And that's why it makes perfect sense that later that night, the cats peed on my business suit. I am reading, no, savoring, Isabel Allende's memoir, My Invented Country. I am taking my time with this book, picking up small portions delicately, raising them to my eyes and mind with slow anticipation, chewing and digesting them lingeringly. Once, I considered myself an avid scholar of the magical realism genre. That was back in my scholar days---the late 80s and early 90s. Gabriel Garcia Marquez was king. I found Allende's House of the Spirits a pale imitation of his work. Why was magical realism so appealing to me? Nobody ever asked. However, Allende, in her memoir, has finally answered the question for me: I am a ghost of Chile, wandering the practical world with an imaginative mind fixated in superstition and surprise divined from stockpiles of observation. Chileans, Allende asserts, offset their superstition, sobriety and natural intolerance with a love of regulation, "I believe this obsession of ours with legality is a kind of safeguard against the aggression we carry inside; without the nightstick of law we would go after one another tooth and claw." She says the Chilean bureaucracy is a crazy tangle of reel after reel of red tape, "Recently, a busload of us tourists crossing the border between Chile and Argentina had to wait an hour and a half while our documents were checked. getting through the Berlin Wall was easier. Kafka was Chilean." Chilean, you see, is more than citizenship; it is a frame of mind. Her memoir is an unraveling of this Chilean frame of mind---a sociological exploration of how such democratically minded people ("We love to vote," Allende writes, "If a dozen kids get together in the schoolyard to play soccer, the first thing they do is write a set of rules and vote for a president, a board of directors, and a treasurer.") who live so precariously amid natural disasters and poverty remain so optimistically and superstitiously hopeful. She writes, "At heart we know very well that life isn't easy. Ours is a land of earthquakes, why wouldn't we be fatalists? Given the circumstances, we have no choice but to be also a little stoic---though there's no reason to be too dignified about it; we are free to complain all we want." Chileans, it seems, practically accept the strange and catastrophic, which explains magical realism in so many respects. In a life of such vulnerability to things beyond your control, the best method for explaining reaction is to seek a causal action in yourself. It explains the reason why Allende's family embraced the Chilean spartan and stoic belief that discomfort is good for one's health. Her grandfather advocated cold showers, lumpy beds and bad shoes and food to ward off tragedies such as cancer. Bring the bad on yourself, it seems to suggest, and divine intervention will not be compelled to force you to suffer. I know this mentality well. One time I heard a performer making a joke about the Latina nerves, "The women in my family have more nerves than women of other races, and they are more active nerves, too. As a result, it seems their nerves are constantly in question or on the verge of collapse." I know this mentality well, too. I'm not just enjoying Allende's memoir---which displays a greater gift for narrative, even, above and beyond her fiction, which I have since come to appreciate---I am eternally grateful that she pointed me to my country of soul origin. She carried her Chilean mindset with her into her new life in the US, and I have apparently carried mine with me into this life. I was never sure about reincarnation or ghosts, but reading this book has convinced me. It is the best explanation. Allende's house in California was built distressed, she shares, with high open ceilings to provide space for all the ghosts. This makes sense to me. Around me everyone works so hard to keep the old, the ghosts, the past shut out, arming themselves with phrases such as "let it go" and "let sleeping dogs lie." I, on the other hand, strongly and firmly am convinced that sleeping dogs will eventually wake up, and ghosts will haunt you no matter what, so may as well be ready for when that dog wakes and create space for those ghosts. I believe it is better to work around the spiders and let them go about their business as I go about mine. In Chile, this would make sense. In the US, not so much. It has always given me the sense of being foreign; moving frequently as a child only exacerbated that sense. From the moment we left Chile and began to travel from country to country I became the new girl in the neighborhood, the foreigner at school, the strange one who dressed differently and didn't even know how to talk like everyone else. I couldn't picture the time that I would return to familiar territory in Santiago, but when finally that happened, several years later, I didn't fit in there either, because I'd been away too long. Being a foreigner, as I have been almost forever, means that I have to make a much greater effort than the natives, which has kept me on my toes and forced me to become flexible and adapt to different surroundings. This condition has some advantages for someone who earns her living by observing; nothing seems natural to me, almost everything surprises me. He never has any doubt about himself or his circumstances. He has always lived in the same country, he knows how to order from a catalogue, vote by mail, open a bottle of aspirin, and where to call when the kitchen floods. I envy his certainty. he feels totally at home in his body, in his language, in his life. There's a certain freshness and innocence in people who have always lived in one place and can count on witnesses to their passage through the world. In contrast, those of us who have moved on many times develop tough skin out of necessity. Since we lack roots or corroboration of who we are, we must put our trust in memory to give continuity to our lives...but memory is always cloudy, we can't trust it. Like Allende, I married a native, and a few years ago, after some time in another foreign place, we returned to his place of origin. I, who have no ties to my past, each ribbon severed eventually with each subsequent move---it is too hard to maintain a past life while building a new one, not too mention the space for you closes and everyone is so married to the concept of moving on---remain intrigued that my husband's old piano teacher lives in our neighborhood, we run into his former teachers at restaurants, and a past classmate is his mother's eye doctor. His parents are still married, and until recently, lived in the exact same house my husband grew up in. I realized our differences on a visit back to his home early in our marriage; he still carried house keys and felt no hesitation about using them to enter his childhood home with no notice. In contrast, I knock on the front door of my parents' homes, places they moved to after I was an adult, and waited permission to enter. I envy these roots, and do not understand why my husband works so hard to shake and avoid them. As a result, I can identify with Allende when she says she has absolutely no sense of certainty. I know what she means when she says, "A friend of mine says that we---we Chileans---may be poor, but that we have delicate feet. She's referring, of course, to our unjustified sensitivity, always just beneath the skin, to our solemn pride, to our tendency to become idiotically sober given the slightest opportunity." When she describes Chile as, ". . .the way a country road might look as night falls, when the long shadows of the poplars trick our vision and the landscape is no more substantial than a dream," I know this place, and have been there. 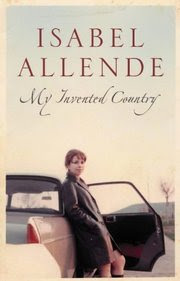 Allende describes my invented country when she writes about her own.